Long-time E-Verse friend Katy Evans-Bush, who also serves as the London correspondent for the Contemporary Poetry Review, recently published her first full length poetry collection Me and the Dead, issued by Salt in the UK. We invited her to stop by E-Verse on her virtual book tour. 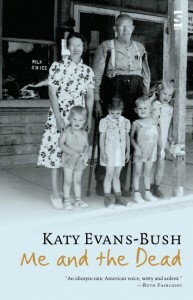 I interviewed Ms. Evans-Bush about her new book. Ernest Hilbert: You’ve lived in London for quite a long time. Are you still thought of as an American poet? English poets who have come to the US may soak up some of the American style—consider Thom Gunn, and, more recently, Glyn Maxwell—but they remain every inch English. This is partly a point of pride, of course. I wonder how it works with Americans going the other way. A certain type of American loves the idea of shedding his Americanisms and becoming somehow international. Ezra Pound was surely never thought of as anything more than an expatriate during his time in London, but T.S. Eliot stuck around and eventually donned the full mantle, including devotion to the Church of England, the crown, and all the rest (think of the oft-quoted introduction to For Lancelot Andrewes). Where do you fit in? How are you seen? Katy Evans-Bush: Well I’ve been in London since I was 19, essentially. I had a sudden flash of insight one day when I was about 20, that “I could live here for 20 years and I’ll always just be ‘That American Woman.’ And lo, it has come to pass. Two English husbands, three English kids—is that not enough of a mantle? I went ten years at one stage without ever going to the States—I barely even knew any other Americans—once I even went three whole years without once leaving London. And still, always, I find people interpreting me socially in terms of New York. My boyfriend seems to think I have a thing called “Ethel Merman moments.” Can you imagine what that does to a girl? But seriously. I feel immersed in London, and consider myself a Londoner. 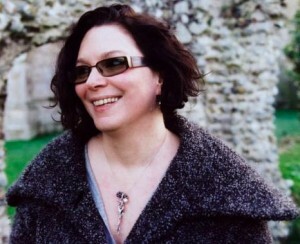 I’m not a cod Englishwoman. My family comes from all over the place but a quarter of it is Welsh: my grandfather emigrated. Thanks to my sister’s indefatigable genealogical efforts I know my ancestors were Londoners (as well as many other things of course). I definitely don’t feel as foreign as taxi drivers, for example, like to paint me. As a writer, though, maybe my real world is books. Culture is international now, and to the extent that it is, American culture is rich for the pickings. I’m very lucky that way, I suppose—though I also love the ways in which Europeans pick American culture. In terms of how I’m seen, it is very much in terms of Americanness, it seems—it has been made clear to me by others how my poetic roots lie equally on both sides of the Atlantic. I’ve completely lost touch with that whole Beat thing in the USA, and I came to New Formalism very late—it isn’t an issue over here and I literally had no idea! But my early influences were American—Millay, EAR, Roethke, the Confessionals—as well as Blake, Shelley etc. And of course Eliot and Pound, as you mentioned. They set the precedent, didn’t they? EH: You set a version of Catullus in Cockney slang. Why did you choose that instead of an American slang? Do you feel more strongly English in a cultural sense now? KEB: I’ve spent my entire adult life here in this city, so I guess it just came to me that way. I was watching EastEnders a lot. And I set the story in Leyton, which is E10, and it’s Catullus X. So it all came together. I’m out of touch with current American slang. I hear about it on TV like everyone else here. Like any immigrant I sort of stop about the time I left the country. I found myself saying to someone yesterday, “I used to love A-1 sauce.” I did, too. But I think I haven’t tasted it in 20 years. And when I go to America, they all think I’m really (or “too”) English. You can’t win. EH: Me and the Dead, I see. Why not The Dead and Me? KEB: I think that’s my Harriet the Spy influence creeping out. I liked the way it sounded like a kid. EH: I am an opera fan. Not one of the peculiar, die-hard ones, but I do attend regular opera seasons and once subscribed to Opera News magazine. Tell me something about the origins of “Dinosaur Opera,” in which you visualize the absurdity of a dinosaur opera. So opera clearly made some kind of impression on me, though I hated it at the time. I think of opera as a quintessential element of civilisation, I guess. A pinnacle. A fineness. Having said which, it seems a bit odd even to me if the words above constitute a civilising impulse! Ah well. EH: I found “Dinosaur Opera” very amusing, particularly the T Rex in his waist-coat. I admire its efficient working parts as much as the intelligent and playful sentiment behind it. What could you have been discussing at the time that would have led your friend to prophesy a dinosaur opera? KEB: I’m so pleased you admire its technical aspects! The poem is largely about working parts, as it happens, thinking about it. The gauzes, costume girls, pins, rehearsals. But I never thought of this before, so you tell me. My friend is a little odd; these strange notions of hers make her also a good poet. If I remember correctly, she made some passing reference to “dinosaur opera,” as if it already existed. I probably said, “What the hell are you talking about?” And she replied in epigraph form. The rest, as they say, is pre-history. EH: Aside from its immediate appeal, as a very funny poem, it is also an insightful satire. Opera has put itself through many contortions—from outrageous stagings of classic operas to new operas on outrageous themes—to regain what some might call a sense of relevance in the modern age, to blow off some of the museum dust that regularly settles on the art form. It all becomes parody after a while. Your use of dinosaurs, great, clumsy, cold-blooded and now-extinct reptiles, is a very nice way of pointing up the archaisms and pretensions that cling to the art form. What else did you have in mind when writing the poem? KEB: When I wrote the poem I was just trying to imagine dinosaurs having operas. It never even occurred to me to imagine them having a different kind; I just thought they’d be doing La Boheme or something. I love the T Rex too. But as so often happens, when you write one thing you are also, on a deeper level, writing something you aren’t even aware of at the time. I do think this is a serious poem. People very rarely spot the small detail of the electric cars. I suppose it’s about how in life there is no rehearsal, it’s about beauty and poignancy and death I suppose if you think about it. I came out of it really loving those brave little dinosaurs. And yes, I did deliberately make T Rex’s waistcoat damask: I wanted the comic contrast. I did want him to be a bit camp. Opera is deliciously un-dinosaur. I guess in one way it is a dinosaur . . . and like the dinosaurs maybe it will go extinct—but, as with them, it will be a shame. Anyway, Ernie, I’m surprised to see that this is the poem that’s really spoken to you! Who knew you’d have such an interest in T Rexes in damask waistcoats. I’m glad you’ve given me the chance to talk about this little piece. and carnivores lift their diaphragms in song. for the feeling, not because he has to. making TV documentaries and electric cars. the whole notion of extinction will have become infra dig. in hazy light which will filter through gauzes. Thunder will rumble, basso profundo. waiting for the premier of something big. Listen to Ms. Evans-Bush read one of her poems by clicking on the arrow below. How strange that I came accross this. I work with a small opera company in Canada and we just performed a dinosaur opera. The role of T-rex was indeed sung by a Tenor. I have a friend who performed in yet another dinosaur opera in Alberta earlier this year.